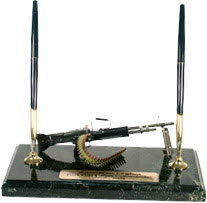 M 60 machine gun [DSK-080] - $90.00 : Metalcraft by Blair - military gifts and memoribilia. We are presenting for your viewing an assortment of military and civilian items that have been mounted on several styles of bases . These models are representations of the guns we have. Most have a pen or pencil set added so as to present themselves as functioning desk sets while some may want to use them simply as TABLE TOP displays. You may want to scan our complete catalog before making your choice,as we have many different types and styles presented. Mix and match any items to achieve your desired effect. Add an engraved name plate to give your presentation a personal touch.